This increases the risks of tampering or false information and authenticity of consumer goods cannot be proven if there is no trust in the authenticity of the data used to prove it. A first step is offered by new mobile technologies. Combined with a QR-code or other scanning and tagging technologies, unique digital identities can be used to link physical goods to their digital representation and provide their related data to consumers. But this data is still not enough to prove the authenticity of the attached goods. IOTA is committed to providing data integrity by allowing data to be stored on a distributed ledger which is easy to access and available to everybody. IOTA’s distributed ledger, the Tangle, is ideal for these micro-transactions given its feeless and permissionless nature. For a goods manufacturer, the feeless micro-transactions structure allows any of its business partners to send IOTA transactions without dealing with the complexity of setting up wallets and buying cryptocurrency. For customers, accessing the IOTA ledger and the information shared on it does not require ownership of cryptocurrency nor to install a wallet. All involved actors can send small amounts of data to the IOTA ledger without the need to identify complex business models to cover the costs of managing this trust infrastructure. Furthermore, IOTA’s permissionless nature allows users to access an always available and general purpose infrastructure provided as a service to deploy new applications. This removes the need to first solve and define complicated governance rules and stakeholders agreements before any infrastructure can be deployed. With EVRYTHNG and IOTA technologies coming together, product data can be opened up to consumers with embedded authenticity and integrity. With this in mind, back in January, we organized a small half-day IOTA/EVRYTHNG hackathon. The target was simple: increase trust in the products data that the EVRYTHNG platform collects and transfer this trust to the consumers of those goods. As soon as data is collected and attached to a product digital identity, it is stored in the EVRYTHNG platform and at the same time a hash (e.g. SHA256) of it is stored into the IOTA Tangle. This hash becomes timestamped and immutable. So once a digitized product ends in the hands of the consumers, its digital identity can be instantly scanned with a smartphone and all relevant data will appear on the screen. To be sure that this data is real and not an altered new version, an app on the consumer’s mobile phone can automatically match the received data hash against the already computed one from the IOTA Tangle. If the two are a match, the data is genuine. For simplicity, this is done by a dedicated consumer app. However, due to the open nature of IOTA, consumers can also do the same with any tool of their choice, manually exploring the IOTA Tangle through existing and independent web tools (e.g. https://thetangle.org/). As a result, manufacturers can not repudiate data attached to their products, and even EVRYTHNG can not change it. This way, trust in product data is brought to consumers to empower them with the ability to identify fake data. How did we do this? In order to support its customers and goods manufacturers needs, EVRYTHNG already developed the Blockchain Integration Hub (https://developers.evrythng.com/docs/blockchain-integration-hub). The Hub integrates with the EVRYTHNG main solution — the Reactor Rules Engine. This engine allows the EVRYTHNG’s platform users (e.g. manufacturers) to develop scripts that trigger actions associated to products’ digital identities when specific conditions are met. Thanks to the integration with the Hub, one of the new supported actions could be sharing the hash of the data associated to a given digital object onto a target blockchain. And in fact the Hub already integrates different blockchains for this purpose. But how and why has IOTA been integrated then? For each digital identity managed by the EVRYTHNG engine, a digital twin is created. The digital twin is a digital representation of a product that solely contains the information needed to be stored on a blockchain or distributed ledger. In this case the product’s digital identity and the hash of its associated data. In the case of IOTA, a dedicated MAM Channel is created for each digital twin. “What makes a significant step forward here is the simplicity of integration and the natural fit that MAM channels provide to the concept of capturing, sharing and validating supply chain events,” said Dominique Guinard, EVRYTHNG CTO. “The different events in the life-cycle of a product that need to be sent to a DLT can easily be linked in the same MAM channel, without any extra work,” Dominique concluded. Without a second layer protocol like IOTA’s MAM, sharing multiple information requires the creation of multiple transactions. And maintaining a link between these transactions requires extra off-line overhead resources. This is the typical architecture on other blockchains, but with MAM such functionality is prepared and ready to be directly deployed. In supply chains where each product is digitized, the amount of overhead might be overwhelming and impossible to manage. However, the availability of the MAM protocol is not the only IOTA feature that perfectly matched the EVRYTHNG use cases and requirements. IOTA’s permissionless nature allows supply chains actors and EVRYTHNG to secure the integrity of the shared data with a computation power which is higher than any other permissioned network. The same permissionless nature of the IOTA ledger makes it possible to open consumer access to such data immediately, without the need to pre-establish trust with any organization recipient of this information. 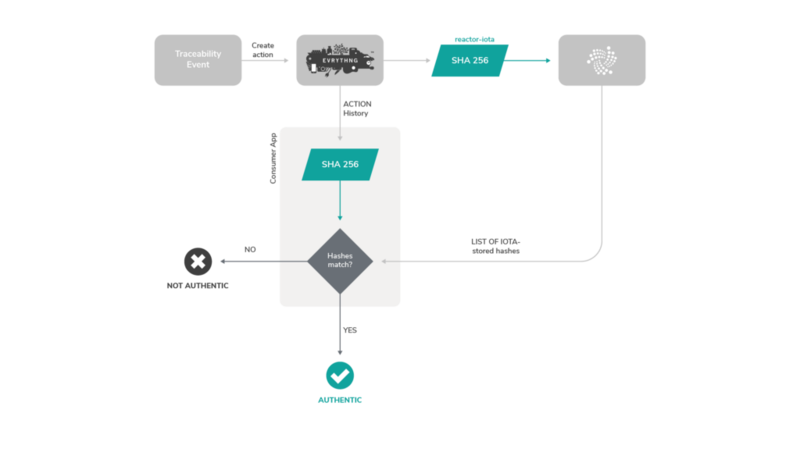 In addition, the feeless IOTA transaction structure allows the solution to scale independently from the number and type of supply chain managed identity and events. 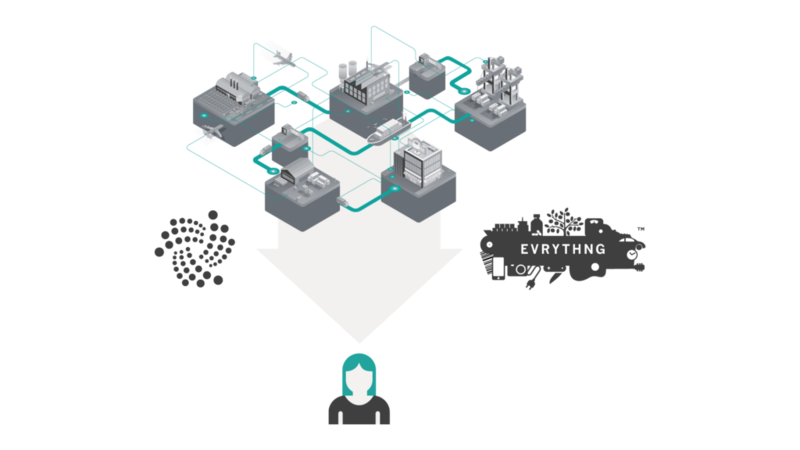 The lightweight IOTA protocol, which doesn’t require expensive Proof-of-Work (PoW), meets the requirements of supply chains to design energy-efficient and greener solutions. Following the success of this implementation, a number of real use cases are currently being tested by EVRYTHING with its customers (e.g., product manufacturers) and their consumers. IOTA and EVRYTHNG are also exploring the required further development efforts to integrate MAM with supply chain standards, in the aim to establish IOTA as reference architecture for supply chain transparency and traceability. IOTA and EVRYTHNG Collaboration: This is how you make a transparent supply chain was originally published in IOTA on Medium, where people are continuing the conversation by highlighting and responding to this story.